Chayair Mnf. and Aviation started 1997. Flight-testing and certification of the first prototype gyroplane (the Sycamore) was completed mid 1998, production started in September. A limited production schedule of one unit every six weeks was planned for the first year. Now manufacturing capacity will allow the production of one unit every three weeks. The Sycamore gyroplane was appropriately named after the Sycamore tree, the seed of which freely spins or auto rotates to the ground. Chayair is an aviation company specialized in building gyroplanes. The modern factory is situated in the northern part of South Africa, the Limpopo province, in the city of Musina. Test flights are executed on the Musina (Messina) airfield (MEZ/FAMS). Research and development is done in the modern facilities in South Africa. 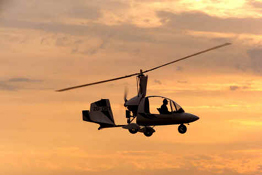 Several new gyroplane designs are under development at this stage.